Neem oil insecticide is often a great solution if you are having problems with insects, mites, or fungi bothering your plants. What organic gardeners love about it is that it is safe to use: It will not harm you, your kids, your pets, or your livestock. It is safe even for most wildlife, its insecticidal properties being targeted to specific pests that damage garden plants. Learn examples of pests that neem is effective against. Neem oil is pressed out of the seeds obtained from neem trees. The botanical name for this tree is Azadirachta indica. The tree is a broadleaf evergreen that is indigenous to India and adjacent areas. The tree belongs to the mahogany family and commonly becomes 50 to 60 feet tall. In addition to its use as an organic insecticide spray, this oil has been used medicinally and in the cosmetics industry. Neem oil and the tree from which it is derived are so called from the Sanskrit, nimba. One seller of the product, Dyna-Gro, explains how it works as an organic insecticide: "It disrupts insects' hormonal balance so they die before they molt to the next life stage." The National Pesticide Information Center states, "Neem oil is made of many components. Azadirachtin is the most active. It reduces insect feeding and acts as a repellent. It also interferes with insect hormone systems, making it harder for insects to grow and lay eggs." According to the EPA, "Azadirachtin acts in the following ways: It deters certain insects, such as locusts, from feeding and it interferes with the normal life cycle of insects, including feeding, molting, mating, and egg laying." Just how much Azadirachtin a product you buy off the shelf contains is not, however, always readily apparent; the label may refer to "other ingredients," then fail to specify. Mix the neem oil at the rate of 2 tablespoons (1 ounce) per gallon of water. Mix the solution thoroughly. Spray all plant surfaces (including undersides of leaves) until completely wet. A great sprayer to use to apply neem oil on plants is Garden Gorilla. This company puts out one of the easiest garden sprayers to use. When applied as a preventative, neem oil should be applied on a 7- to 14-day schedule according to the manufacturers of 70% neem Oil. To control a pest or disease already present, they recommend an application on a 7-day schedule. Neem oil insecticide kills some pests after they have eaten leaves sprayed with it, while it repels others with its strong smell. Neem oil is used to control many pests, including whitefly, aphids, Japanese beetles, moth larvae, scale, and spider mites. As it kills mites, which are not insects but, instead, related to spiders and ticks, it is listed as a "miticide." Sprays containing clarified hydrophobic extract of neem oil are also used as fungicides against rust, black spot, mildew, leaf spot, scab, anthracnose, blight, and botrytis. Besides being an organic insecticide, using this product allows you to target pests specifically as opposed to beneficial insects such as bees and lady beetles. By definition, "pests" are the insects eating your plants, and neem oil, when properly applied, kills an insect only if it ingests the sprayed foliage (bees and lady beetles do not eat plant leaves). Flowering dogwood trees (Cornus florida) are highly susceptible to powdery mildew. Because powdery mildew is a fungus, the fungicidal properties of neem oil make the product effective for fighting this problem. Blue Star juniper (Juniperus squamata Blue Star) can succumb to infestations of spider mites. 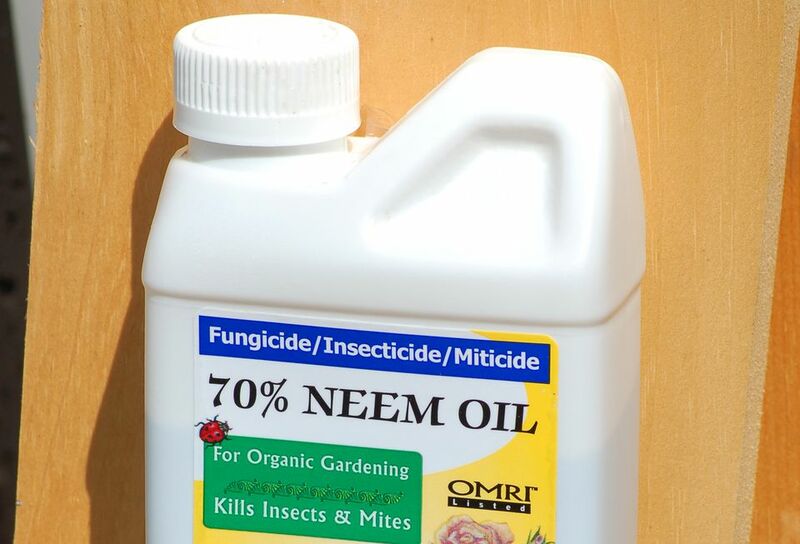 Take advantage of neem oil's miticidal properties to kill spider mites on the plant. Spraying Colorado blue spruce trees (Picea pungens) with neem oil can work as an insecticide against Cooley spruce gall adelgid and aphids. In What Sense Do "Hardened-Off" Plants Become Harder?